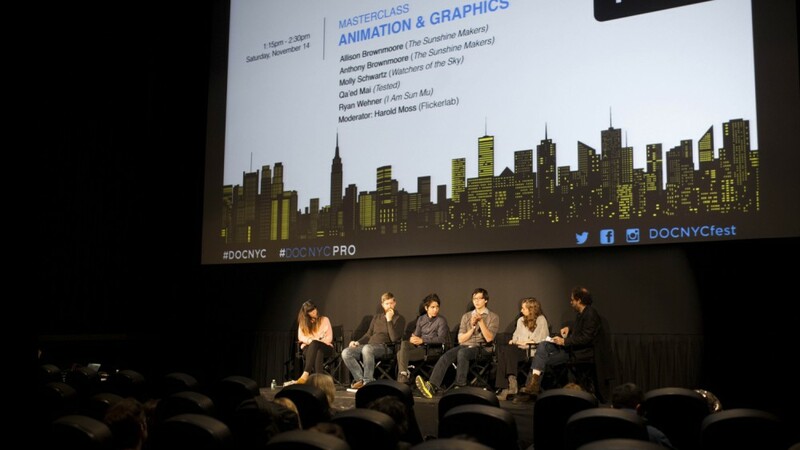 We had a really fantastic time at the DOCNYC Festival, speaking on the panel for the Animation and Graphics Masterclass. We were joined onstage by an array of talented designers, and it was an honour to have been included amongst such talent. They included Molly Schwartz (Watchers of the Sky), Qa’ed Mai (Tested) and Ryan Wehner (I Am Sun Mu). The masterclass was an hour and a half in length, moderated by Harold Moss. After a brief introduction we were asked to present a case study of the film we had designed for the festival. We discussed our involvement with The Sunshine Makers, and how we initially became involved in the process. We then discussed how the design process worked throughout the edit, including discoveries and challenges. And finally the floor was opened to questions. The majority of attendees were documentary proudcers and directors who were either interested in using animation in their film or were already starting to engage services and were interested in streamlining the process. Here are two of the key responses to questions during the Q and A. What advice would you offer a new director/producer who is interested in using animation/design in their film? Reach out to your designer early in the process, not necessarily to start working but to get them engaged and starting to open to possibilities. Anything you can provide them at this stage become clues for later, the treatment for example is a brilliant way to share your vision on a more in depth level, that the designer can refer to going forward. It’s gold dust! Once you’ve started working together, keep them informed and involved in the process. Typically what’s required now of a designer is not as straightforward as it has been in the past – they often will be involved in filming assets, visual effects or editing their sequences. Many of the panellists enjoyed having access to the rushes, or rushes selects, for example, as it provides a greater degree of freedom when they’re making design choices. The panellists agreed with head shaking vigour – it was better to have too much than too little. 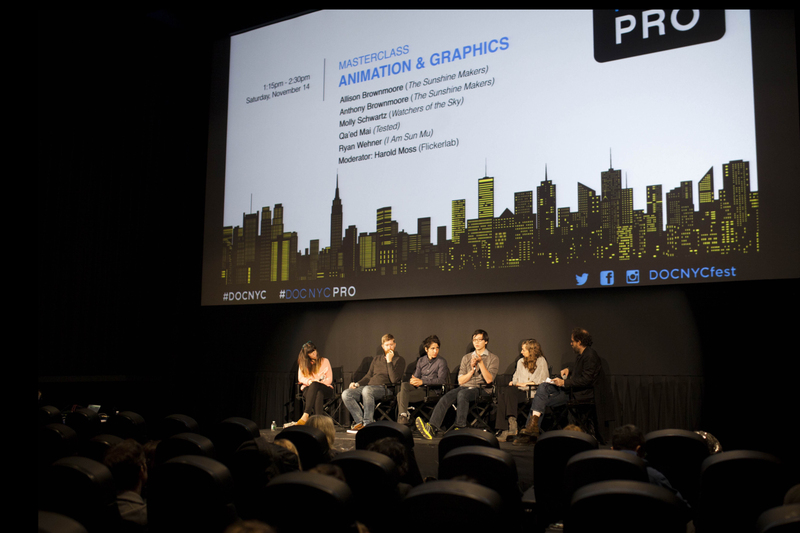 Design and animation often plays a narrative role in the film. How does the communication between the edit and the designer work? It’s a common question – how much does the editor need to ‘edit’ their sequence if it’s going to heading off to a designer? The panellists unanimously agreed that it was ideal to have the sequence edited in a way that hit the key narrative points, and also provided a clue as to how those points would like to be hit. Is the visual imagery realistic or conceptual? Is it abstract or metaphorical? The references used in the edit could be very rudimentary, but it gives us an important clue which can lead us down the right path more quickly. We won’t necessarily use the edited sequence as it was edited, but it gives important clues to speed up our process. We thoroughly enjoyed speaking at the event, it was a fantastic experience engaging with other artists and film makers on a topic we’re really passionate about!